Beth Reinke is a registered dietitian with a master's degree in nutrition. If you’re following a low-carb diet, it’s tempting to limit breakfast cereal to a sprinkling on your Greek yogurt -- and with good reason. Because grains are carbohydrate-rich, there are few truly low-carb cereal options, and many boast upwards of 40 grams per serving. As of October 2015, the FDA hasn’t defined what “low-carb” means in terms of grams or percentage of calories. 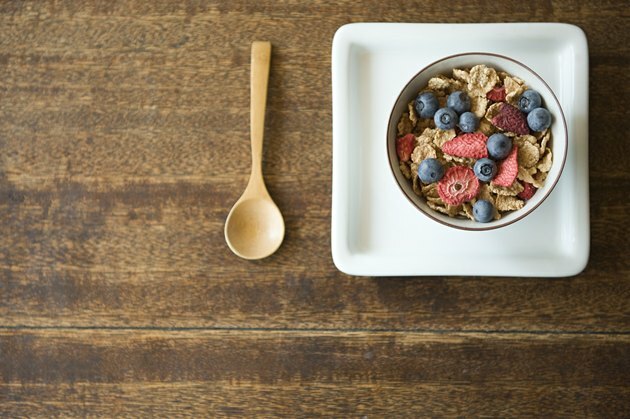 However, with a little detective work, you can find hot or cold cereals with 20 grams of carbohydrates or fewer per serving, which can fit into some lower-carb diets. The carb content of cereals can be counterintuitive, with some sweeter-tasting varieties having fewer grams than healthy-looking kinds. For instance, a 3/4-cup serving of Honey Nut or Chocolate Cheerios has 22 grams of carbs, while a 1-cup serving of whole wheat mini-biscuits or bran flakes with raisins has 40 to 45 grams, depending on the brand. Most granolas are high-carb as well, with 35-plus grams per serving. The carbs in similar cereals may vary between brands, too, so inspect the nutrition facts label on every box before you buy. If you enjoy flaked cereal, grab a box of Special K Protein from your grocer’s shelves. A ¾-cup serving has 19 grams of carbohydrate, and it’s sweetened with both sugar and sucralose. Natural food stores may carry Julian Bakery Paleo Coconut Flakes, which has no added sweeteners and contains only three ingredients – coconut meat, coconut water and palm starch – and 14 grams of carbs per 1-ounce serving. Hi-Lo cereal, original flavor, which can be ordered online, contains only 13 carb grams per ½ cup and gets its sweetness from evaporated cane juice. When you’re limiting carbs, cereals with dried fruit mixed in are best left on the shelf, because fruit increases the carb grams. Nuts are low in carbohydrates, so they add crunch and flavor without boosting the carb count. Three nutty cereals from Nutritious Living are lower-carb choices. Dr. Sears Zone Cereal in the honey almond flavor has 16 grams per ½-cup serving. It contains multiple grains and is sweetened with honey, molasses and evaporated cane juice crystals. Hi-Lo cereal comes in two nut-wielding flavors -- vanilla almond and maple pecan -- both with 13 grams of carbs per ½-cup serving. Like the regular flavor, these Hi-Lo cereals get their sweetness from an artificial sweetener, sucralose. A standby snack for everyone from toddlers to seniors, plain Cheerios are a moderately low-carb choice, with 20 grams per cup. Kay’s Naturals cereals in three flavors -- French vanilla, honey almond and apple cinnamon -- have 18 to 19 grams per 1.2-ounce serving. They get their sweet flavors from honey, sugar and stevia. Another low-carb choice is the soy-based cereal, Smaps, in cocoa or sweet maple flavors, which contain monk fruit or low-glycemic fruit concentrate and 8 grams of carbs per ½-cup serving. With airy cereals like plain puffed rice or wheat, you can eat a whole cup for a fairly low carb count. Puffed rice has 15 grams of carbs per cup, while puffed wheat has only 13 grams. Choosing a sweetened version of puffed cereal gives you more carbs. One example is Kellogg’s Honey Smacks, with 24 grams in a smaller, ¾-cup serving. Sometimes a hot cereal hits the spot, but with around 28 grams per serving, regular oatmeal may overshoot your carb goals. However, sugar-free instant oatmeal has around 19 grams per packet, if you don’t mind the artificial sweeteners, and instant Cream of Wheat has 20 grams per packet, which is about ¾ cup prepared. Two other brands, Sensato and ProtiDIET, are sucralose-sweetened hot cereals. Sensato hot cereal comes in apple cinnamon, strawberrilicious and vanilla almond, with 12, 11 and 10 grams of carbs per ½ cup, respectively. ProtiDIET oatmeals have 6 carb grams per packet and come in cinnamon spice, apple cinnamon and maple brown sugar flavors. No matter which kind of lower-carb cereal you choose, what you pour on it can add more carbohydrates. Cow’s milk adds another 6 grams per 1/2 cup, while unsweetened almond or soy milk ups your carbs by around 4 grams per ½ cup. With less than 1 gram per cup, unsweetened coconut milk or cashew milk are your lowest-carb milk options.